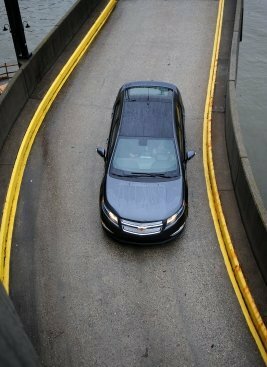 “I Speak for the Trees” contributor Charlie Lawton has returned to S:S:L with a review of the Chevy Volt. Part II to follow. Every once in a while, as I get older, something about our everyday world circa 2011 just blows my mind. It’s as if my inner twelve year old, who’s permanently stuck in 1990, peeks out into 2011 through my adult eyes, sees what the future has brought us, and just totally geeks out. For example, not long ago, I took a picture of a Tesla Roadster with my iPhone. It was a pretty ordinary thing to do, but I thought, “Holy damn. I just took a picture of an electric sports car with a phone that has a camera, an internet connection, a processor five times faster than the one in my first computer, and a navigation system. This is the future.” And I think it blew my mind precisely because it was such an ordinary, commonplace thing, because in 2011, tiny pocket-size supercomputers are everywhere. It’s a mild flavor of future shock, the disorientation people feel in the face of rapid technological and social change. I started feeling a similar mix of emotions as I stood in line one warm March afternoon outside the Denver Convention Center, waiting to drive a 2011 Chevrolet Volt. The Denver Auto Show was in full swing, and many of the manufacturers had test-drive events to show off the latest metal. Over at the GM tent, they had Equinoxes, Camaros, Cruzes, and Volts to drive. I’d been reading about the Volt for months, so I immediately went over to check it out. Admittedly, this was my tribe – nerdy dudes who could define “well-to-wheel energy efficiency” off the top of their heads. Seven was far too many of us in one location. The guy behind me and the guy in front of me chatted at the top of their lungs about alternative energy for half an hour. Gritting my teeth as one guy enthusiastically mentioned his love of hydrogen fuel cells, my every organ yearning to verbally disagree, I decided not to be that guy and checked my email on my phone instead. Finally, I was up. 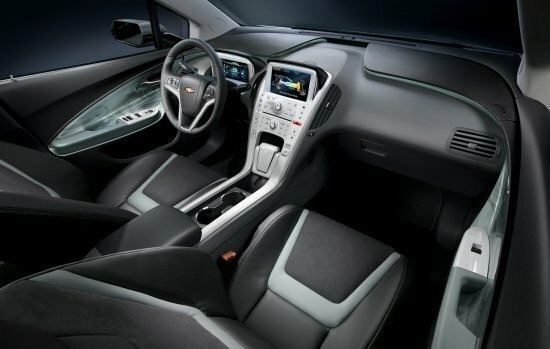 The Volt I drove was a handsome gray example, with leather seating and the gray interior (an option over the standard iPod white). My first impression was that it wasn’t that big – it’s firmly in the C-segment, along with the Audi A3 and Ford Focus. It’s got the high-assed Kammback teardrop shape going, much like other very aerodynamic cars like the Prius and the Honda CRX. It manages to pull off that shape better than the Prius, however, as it trades the Toyota’s willful, self-conscious oddness for sharper, more conservative sheetmetal that’s a good deal more muscular. It’s also a surprisingly expensive-looking car in its details and presence. It’s grownup-looking and quite handsome, almost like what we all wish Acuras still looked like. So I got in, joined by a friendly, middle-aged GM public-relations person whose name I promptly forgot. Let’s just call her Pleasant Fortysomething Flack. And in short order drove off town an alley towards 15th Street. The whole experience was not dissimilar from starting up an ordinary car with pushbutton ignition. I got in, adjusted the mirrors, pressed the start button, and moved the transmission selector to “D.” The only thing missing was the chuckle and roar of an engine turning over; in its place was merely the whooshing of the A/C. An engine does live down there under the hood, but it would only turn on once the 31 remaining miles of battery power were exhausted. The hybrids already on the market are powered directly by their gas engines, with electric motors serving as helpful assistants, lending their power when needed so the engine doesn’t have to work too hard. They also run in reverse when slowing down, which recoups some energy through regenerative braking, and allow the engine to shut off when the car is stationary. The Volt is a total reversal of that concept; the big 149hp electric motor is the primary source of motive power, and the 75hp 1.4L Ecotec four-cylinder engine serves to spin a generator. When the batteries run low, usually after 25-40 miles of driving, the engine fires up and provides electric power. This is an electric car assisted by a gas motor, in other words. You plug it in every night, but if you’re driving further than 40 miles, it can run on gasoline as long as you keep the tank topped up. Inside, the surprising level of refinement and attractiveness continued. With gray plastic sheathing the center console, the overall vibe was unashamedly Apple-esque. It wasn’t luxury in the traditional “fine Corinthian leather” sort of way, but it was techy and cool, and the seats were quite good. Space all around is adequate; it’s not wildly spacious, but at 6’0 at 175lb I was as comfortable as I am in anything else, and I could have sat behind myself too. 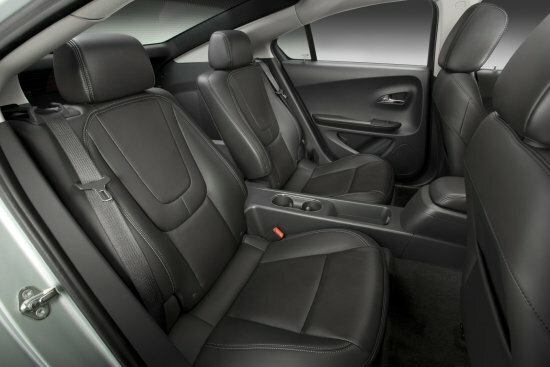 The battery pack occupies a large center tunnel/console that eliminates any possibility of a bench seat, but it’s no less spacious for four than a B7 Audi A4. Overall, it did a pretty OK job of justifying its price as far as aesthetics and appointments go, both inside and out. Its MSRP hovers around $41k, and with $7500 in available tax credits, most buyers should be able to get one for about $33k. I think it just about justifies its price with the tax credits; that’s about the same price as similarly sized entry-level German sports sedans. Out on 15th, I moved smartly out into traffic…in nearly perfect silence. The tires made noise, the A/C made a little white noise, and of course I could hear clattering diesels in nearby trucks, but nothing came from under the hood. I was reminded of the experience of steering a friend’s dead Ford Taurus while he and a few other buddies pushed from behind, except it was kind of like having the entire Denver Broncos defensive line pushing – there was some pretty damn serious torque at work there. 15th Street, however, was a congested mess, so fun was not to be had quite yet. In stop-and-go traffic, it was exactly like driving any other car. Of course, there’s no idling and no conventional automatic transmission, but when you’re not braking and your foot is off the gas, it creeps forward in the expected fashion. But silently, always silently. Quite a pleasant place to be in traffic, really. 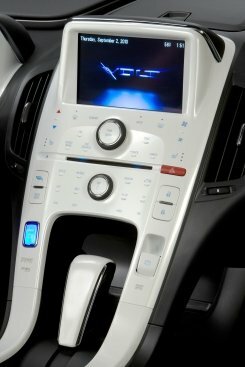 While I “idled” along, I dicked around with the pair of flat LCD screens that serve as the Volt’s instruments, as Pleasant Fortysomething Flack pointed out the car’s many convenient features. One lies behind the steering wheel and displays speed, trip computer information and some basic battery state-of-charge and range information. The other stands atop the center console and displays entertainment and navigation options and some glossy but quite unnecessary animated cartoons of power flowing to and from the battery, regenerative brakes, and motor. This kind of thing is fashionable in hybrids, just in case you care to know that energy is going to the motor while you accelerate. It’s entertaining for about 30 seconds, then somehow both boring and distracting. “And here’s how you switch the Volt into Sport Mode. That maximizes the power available for acceleration,” said my PFF, just as I started getting really bored. “Let’s try that.” So I took the next left, and turned again onto Speer, a major crosstown artery. PFF made pleasant but concerned noises about how this wasn’t really the test drive route, but go ahead, we can get back on track later. Ahead lay three green lights and a highway on-ramp – in other words, a cosmic invitation. So I did my level best to mash the accelerator pedal into the firewall. Nothing much happened besides a quiet, space-age vrrrrrrrrrrrrrrrrrrrrrrr, not even loud enough to drown out Pleasant Fortysomething Flack’s nervous tittering. But then things started going past the windows in a oddly fast-forward manner, and I became aware that my body was being gently but authoritatively pushed into the seat cushions. I glanced down at the LCD gauges and discovered that I was exceeding the speed limit by 20mph and gaining. And all of a sudden, I grokked what the British car mags are on about when they talk about how a Rolls-Royce simply wafts down the road. The Volt was no Roller, but it was wafting me silently down the road on a stiff gust of torque all the same. It was incredible. I barely even heard PFF asking me politely to slow down. I slowed a bit to take the turn onto the highway on-ramp, then hit the LOLpedal again, laughing out loud as a swell of silent, glassy-smooth shove wafted me up to 65. It’s not a breathtakingly fast car, but it’s somehow breathtaking all the same. You’d expect to miss the mechanical noise and drama of winding out a gasser car, but I didn’t. I was thunderstruck by how honestly special it was, what a unique feeling it was to have all my power and torque available all the time. An electric motor has a torque curve like a dining table. Driving it had a definite sci-fi flavor, with its quiet thrumming and quietly speedy demeanor; in black, you could take it out on a rainy night and pretend you were out hunting Replicants. I took the next exit at 65mph, the Volt remaining planted and confident as I looped around the offramp. It’s a crisp handler and feels planted, but it’s heavy; that battery pack is not lightweight. It’s miles more fun to drive than a Prius, however. 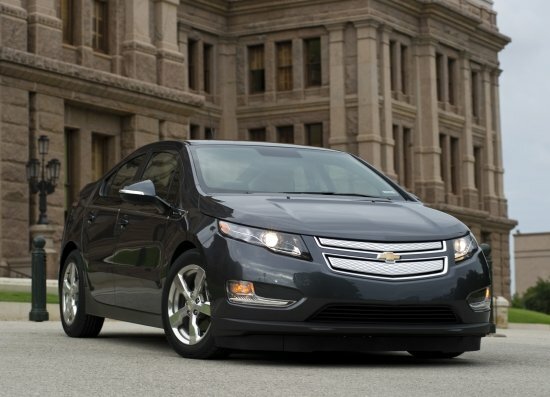 An enthusiastic driver wouldn’t find the Volt a chore to drive from a handling standpoint. You could probably even take it to an autocross and have a good time. Because this car, this easy-to-drive, rather nicely appointed small fastback sedan which you can buy right now…it’s the future. Almost every other car I can think of is merely a refinement of the way the carmakers of the world have been building cars for decades. The Volt is one of the first that steps past the current paradigm entirely, in a way that even existing hybrids haven’t. It has a drivetrain that’s laid out and engineered in a way that’s never been seen in a modern production car. It’s got battery technology that most mainstream hybrids haven’t even adopted yet. It can be run on any source of electrical power you want – solar, wind, or grid power. It’s unique and quite special to drive, but no less accessible and user-friendly for that. But at the same time, it’s a pretty ordinary car. It can still be filled up at any gas station. It seats four and can carry their luggage. I could have rented one and figured out the controls in under a minute. It’s comfy and quiet. It’s a pretty nice car inside and out, about as nice as others in its price class. I could take it skiing or on a road trip. I think that, like when I got gobsmacked by my iPhone, the fact that it’s pretty ordinary somehow magnifies the future shock. I think it’s an incredible feat just to to engineer an entirely new drivetrain layout, to invent new batteries and management systems, to optimize aerodynamics and weight to maximize range while adding a heavy battery pack, and to manage costs so it’s still affordable to a middle class buyer. To take all that new technology and make it into a so polished and refined and well-sorted, to make it such a real car rather than a half-baked science project like other electric cars of the past…that’s a monumental, game-changing achievement. $41k is the deal of the century; it’d be special at twice the price. Stay tuned for Future Shock, Part Two: A Brave New Plugged-In World. I’ll dig a little deeper into the Volt’s technology, its economics, and its environmental performance. Next postMay/June preview: SSL hits the road and track.